Experience the unique culture and history of Kitakata as you visit temples and shrines in the city. During this half-day tour, travel with your private guide throughout the city and stop at a Shinto shrine, a Buddhist temple, and a wagashi sweet shop. At about 11:20am, meet your guide at the Kitakata Station and begin your tour to various religious sites in Kitakata, including Buddhist temples and Shinto shrines. Visit saka gura, founded during the Edo period. Here you will learn how sake is brewed, and are welcome to taste the different sake they brew (own expense). Have free time for lunch and enjoy ramen noodles, or local gourmet food cooked locally at a restaurant with a traditional atmosphere (own expense). 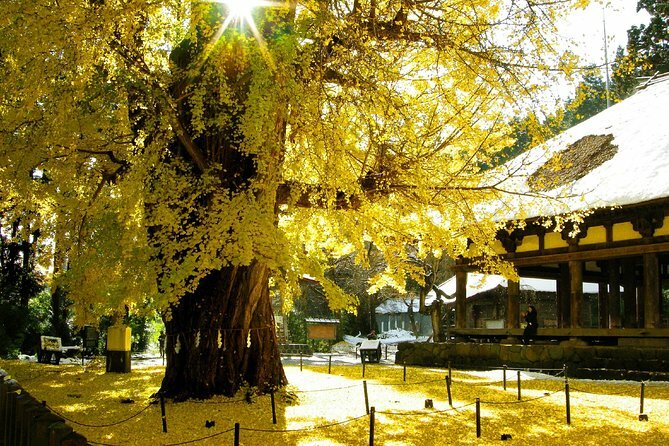 Then, visit a Shinto shrine with a sacred gingko tree of over 600-years-old. This is one of Japan's sacred sites of Kumano Sanzan, Kumano's three major shrines. The shrine used to be worshiped by local samurai as a guardian god. It was also a place for Shugendo, for practitioners of austerity. The repository of the shrine is open for public. Next, stop by a historic Buddhist temple located on a cliffside. Explore one of the largest Buddharupa in Japan, measuring about 26 feet (8 meters) in length. It is carved out of a piece of wood. At there is a sacred pillar called Dakitsuki bashira. Hug the pillar and make a wish. Take a break and relax at a wagashi sweet shop. At the end of your tour, you will return to Kitakata Station at about 5:30pm.